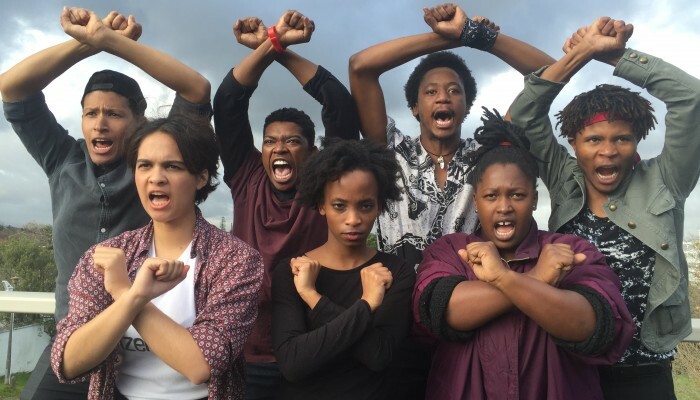 Review of The Fall (produced by Baxter Theatre Centre, South Africa). Radical Theatre from South Africa has a longstanding and hugely respected reputation. Plays like Woza Albert!, Sizwe Banzi is Dead and The Island were some of the most influential plays in the late 20th century. Plays from Apartheid-era South Africa told stories of struggle that those of us living in the West could empathise with and solidarize with. They entertained and educated us about that struggle. The Fall, produced by Cape Town’s Baxter Theatre Centre, is of that illustrious and inspirational traditional. Yet it’s also very different. The Fall is about a struggle in South African which, though only in 2015-16, has already had an impact in the West – witness the campaign to tear down the racist Confederate statues in USA. But even more than that influence, The Fall is about struggles that we are fighting simultaneously alongside our activist sisters and brothers in South Africa. The Fall tells the tale of the student activists, or cadres as they refer to each other throughout, who came together to bring down the statue of Cecil Rhodes which stood until 2015 at the University of Cape Town campus. That’s the part of the story which is well known – less so is the agitation and debate that was necessary to reach that bold act of de-colonisation. The play has been created and performed by the class of 2015 graduate actors, some of whom had been involved or affected by the campaign. The actors perform in a classic Empty Space stage but they fill it with foot-stomping, handclapping, singing, and passionate personal testimony and scenes still hot from the struggle less than two years ago. Anyone who’s been involved in student occupations and struggles will recognise the pace, intensity and passion of the political debate amongst the rapidly radicalised agitators. As the students verbally chip away at the existence of the statue and all that it represents, they grow in experience, in knowledge and in stature to become a new generation of history makers. Bringing down the statue of Rhodes is expressed by the activists as the next step in “the fall of every colonial icon in this country, one by one.” The icon represents the colonial system that the students have to live and learn in, though they are the first generation born after the fall of apartheid. Interestingly apartheid is barely mentioned in the play. They may be living after apartheid but from the way racism and other forms of oppression weigh heavily in their lives far too much of the divisions of the old continue into the present day. The statue of Rhodes is at the centre of the play, but it is only comes into focus mid-point into the story. After their iconoclastic act the cadres are both empowered by their achievement and conscious that much more is wrong with their lives, their life opportunities, South African society and indeed the world. This is where the similarities and parallels with struggles elsewhere really come to the fore. Also the issues of sexuality, non-binary rights, class exploitation and others come to the forefront. As Marx said, it is necessary for people to throw off the muck of ages as part of the revolutionary process of changing the world. The play shows these issues were neither ignored for the sake of ‘unity’ or allowed to divide the movement but instead, they are debated and fought over, sometimes fiercely. It is a great lesson for everyone who wishes ‘the left should stop arguing amongst themselves’ or thinks, ‘why do people bring these divisions to the movement?’ The debates portrayed are about overcoming divisions in society that will adversely affect the movement if they are not addressed. Colin Fancy is a London-based activist, writer and teacher. He is one of the editors of the RS21 website. Thank you Colin for this review! By co-incidence just this morning I spoke about the play with my students at the University of the Western Cape, as part of a series of lectures on the aesthetics and politics of contemporary protests and revolts by students and youth across the African continent (and beyond!) My students, now in their final year were first year students in 2015, and to them these struggles were defining. — The play is brilliant, incredibly powerful,, as you say it makes me happy that it also speak to audiences elsewhere! Thank you Heike that is good to know about your students. I hope the play continues to inspire and educate. As it now exists as a published text there could be further productions, readings and people reading it for themselves. the story telling nature of the play makes it a great read. Hi,I read your blog named “The Earth Shook and Crumbled – ROAPE” daily.Your writing style is awesome, keep up the good work! And you can look our website about تحميل اغاني.